ABOUT "Things To DO IN SAN ANTONIO"
Things to do in San Antonio is a resource for San Antonio attractions, hotels, tickets, restaurants, and events. We have lived in San Antonio for 25 years and have been visiting attractions, parks, restaurants, and stores in our own town. We love our city and would like visitors to come here and experience SeaWorld, Six Flags Fiesta Texas, River Walk, the Alamo, the Missions, downtown, museums, zoo, and surrounding towns and attractions. We would like families that live in San Antonio and visitors to share their experiences with us. We are offering packages through TexasTourism.com that save time and money and make planning to visit San Antonio easier and memorable. We have been donating 5% of our profits through package sales as well as collaborating with our giving partners to contribute to non-profit organizations and individual families which have special needs or chronic illness children. TexasTourism.com - Save Time. Save Money. 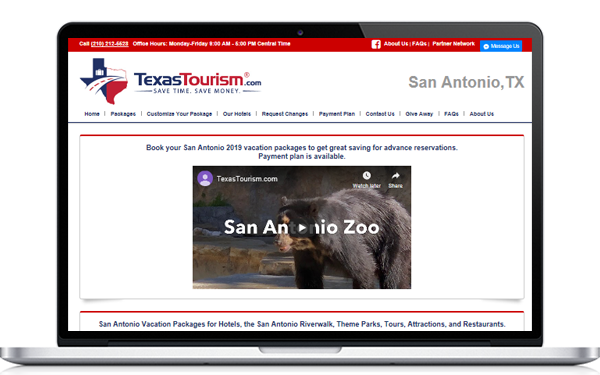 Things to Do in San Antonio is partnering with TexasTourism.com to provide vacation packages including hotels and attractions at discounted prices. You can customize your own vacation package with one of our San Antonio hotel partners and attractions. You can make payments until 2 weeks prior your arrival date. We mail your packages to your home. You save time and money to make an advance booking. You do not need to wait in line to get tickets when you arrive San Antonio. The following companies are our giving partners for families with special needs or chronically ill children.